Walter J. Boyne, former director of the National Air and Space Museum in Washington, D.C., is a retired Air Force colonel and author. He has written more than 400 articles about aviation topics and several books, the most recent of which was Silver Wings. An aeroplane or airplane is a kind of aircraft which uses wings in some form to generate lift. Lighter than air aerostats: balloons and airships. Aerostats float in air in the same way that a ship floats in water, by displacing the air around the craft with a lighter gas (helium or hydrogen), or hot air. The distinction between a balloon and an airship is that an airship has some means of controlling forward motion and steering while balloons simply drift with the wind. Heavier than air 'aerodynes', including autogyros, helicopters and variants, and conventional fixed-wing aircraft: aeroplanes in Commonwealth English, airplanes in North American English. Fixed-wing aircraft generally use an internal-combustion engine and propeller or jet engine to provide thrust, which moves the craft forward through the air. The movement of air over the wings produces lift, which allows the aircraft to fly. Exceptions are gliders which have no engines and gain their thrust from gravity. That is, in order to maintain their forward speed they must descend in relation to the air (but not necessarily in relation to the ground). Helicopters and autogyros use a spinning rotor (a rotary wing) to provide both lift and thrust. The abbreviation VTOL is applied to aircraft other than helicopters that can take off or land vertically. Similarly, STOL stands for Short Take Off and Landing. A first division by design among aircraft is between lighter-than-air and heavier-than-air aircraft. Examples of lighter-than-air aircraft include non-steerable balloons, such as hot air balloons and gas balloons, and airships (sometimes called dirigible balloons), such as blimps (which have a non-rigid construction) and rigid airships, which have a rigid frame. 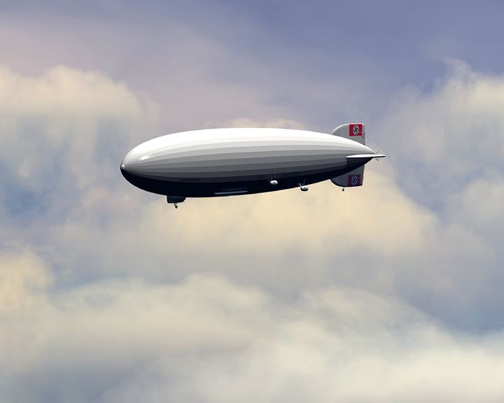 The best-known type of rigid airship is the Zeppelin. In heavier-than-air aircraft, we can discern two major ways to produce the lift: aerodynamic lift and engine lift. In the case of aerodynamic lift, the aircraft is kept in the air because of aerodynamics, usually by means of wings of some kind. With engine lift, the aircraft defeats gravity by sheer engine power. Examples of engine lift aircraft are rockets, and so-called VTOL planes, such as the Hawker Harrier. Among aerodynamically lifted aircraft, the largest number falls in the category of fixed-wing aircraft, where horizontal surfaces produce lift, by profiting from the Coanda effect (aeroplane or airplane). In a "conventional" configuration, the lift surfaces are placed in front of a control surface or tailplane. The number of lift surfaces varied greatly in the pre-1950 period, as biplanes (two wings) and triplanes (three wings) were numerous in the early days of aviation. Subsequently most planes are monoplanes. The reverse configuration is the canard type, where small horizontal control surfaces are placed forward of the wings, near the nose of the aircraft. Other possibilities include the delta-wing, where lift and horizontal control surfaces are combined, and the flying wing, where there is no separate vertical control surface (e.g. the B-2). A variable geometry ('swing-wing') has also been employed in a few examples of combat aircraft (the F-111, Panavia Tornado, and B-1 Lancer, among others). The lifting body configuration where the body itself produce lift has been tested. So far the only significant practical application of the lifting body was in the Space Shuttle. A second large category of aerodynamically lifted aircraft are the rotary-wing aircraft. Here, the lift is provided by rotating rotors. The best-known examples of this category are the helicopter, the earlier autogyro, and the tiltrotor aircraft (such as the V-22 Osprey). A further category might encompass the wing-in-ground-effect types, for example the Russian ekranoplan, also nicknamed the "Caspian Sea Monster" and hovercraft, most of the latter employing a skirt and achieving limited ground or water clearance to reduce friction and achieve speeds above those achieved by boats of similar weight. And finally, the flapping-wing ornithopter is a category of its own. These designs may have considerable potential but are not yet practical. Some types of aircraft, such as the balloon or glider, do not have any propulsion. Balloons drift with the wind. For gliders, takeoff takes place from a high location, or the aircraft is pulled into the air by a ground-based winch or vehicle, or towed aloft by a powered "tug" aircraft. Most early aircraft used a piston-engine with propeller as propulsion. Although the configuration of the engine can vary (rotary, radial, inline), they all work according to the same principles. Just prior to World War II, the first jet engines emerged. Different types exist, such as the ramjet, pulse jet, turbojet, and the turboprop, the latter of which still uses a propeller. A small number of aircraft have been propelled by rocket engines. These have mostly been experimental in nature, but include one mass-produced interceptor (the Messerschmitt Me 163). Three major uses for aircraft may be seen: recreational, military, and commercial. For recreation, almost any type of aircraft can be used, although they are usually small ones. Gliders and balloons are used almost exclusively for recreational purposes although they have been used in times of war in the past. For instance, balloons were used for observation in the American Civil War and World War I. Gliders were used to deliver troops into occupied territory during World War II. The first widespread use of military aircraft was for reconnaissance and surveillance in World War I. Soon they were adapted for attacking the ground or enemy vehicles/ships/guns/aircraft as well, and the first bombers were born. In order to prevent the enemy from bombing, fighter aircraft were developed to intercept and shoot down enemy aircraft. Eventually, two-seat trainers were developed for the purpose of instructing new pilots. The use of transport aircraft enabled the rapid movement of supplies, ammunition, cargo, troops and also casualty evacuation; transport aircraft were also used to drop paratroopers. Tankers are used to refuel planes in mid-air, thus increasing their operational range. Commercial aviation can be divided in passenger transport and cargo transport. For the former, large planes have been developed that can transport up to 500 passengers over large distances. Commercial cargo aircraft are often similar to military transport aircraft, or might be adapted from the passenger fleets of an earlier era. Other uses include search-and-rescue operations (especially by helicopters), border protection, water-bombing (fire-fighting), and aircraft that are purely experimental in nature. Further divisions can be drawn between aircraft designs having a conventional (wheeled) undercarriage, and amphibious floatplanes or flying boats. A flying wing is a type of aircraft design with no tail, one in which the majority of the fuselage is inside a thickened wing. Since a wing is necessary for any aircraft, removing everything else theoretically results in a design with the lowest possible drag. A modification in which the fuselage is still retained is known as the tail-less design. In traditional aircraft designs, the wing is located such that the weight of the plane is just forward of the center of pressure, the point where all of the lift on the plane balances out. This gives the plane a nose-down tendency. To counteract this, small control surfaces are placed at the end of a long tail which pull down, thereby lifting the nose back up. The basic idea is that the plane can "fly itself" to some degree; by reducing power, and thus lift, the nose naturally lowers itself and the plane starts to descend. This system, while simple and safe, has several drawbacks. Locating the control surfaces at the end of the tail means that the plane is longer than it "needs" to be, and much of this extended fuselage cannot carry a load due to balance considerations. Moreover the control surfaces' mere existence causes drag on the plane, lowering its performance. But the biggest problem is that these surfaces are pushing down on the plane, in effect making it weigh more. This trim drag requires extra engine power in order to provide extra lift over and above the "dry weight" of the plane. The same general arrangement, load in front and controls in back of the center of pressure, can be had in another fashion, by bending the wing to the rear. In this case some of the wing is in front and some in back of the center of pressure, and the stability works the same as with external controls. Yet, there are no external controls, and therefore decreased drag and weight. In many situations this can dramatically reduce the overall drag of the plane. The only disadvantage to this design is that in order to be a useful fuselage, the wing must be thicker than normal. At low speeds this is not a concern, but as the speed of the aircraft approaches the speed of sound a new drag effect appears, one that is based on the relative thickness of the wing. For this reason the flying wing is not appropriate for high-speed aircraft, where the drag is likely to be higher than conventional designs. In addition a number of new stability problems also appear at high speed, notably mach tuck, which the design has a much harder time dealing with. For this reason the design was studied almost entirely in the 1930s and 1940s, where it was seen as a natural solution to the problem of building an airliner large enough to carry a reasonable passenger load and enough fuel to cross the Atlantic in regular service. The flying wing's large internal volume and low drag made it "a natural" for this role, and was studied in depth by Jack Northop in the United States, and Alexander Lippisch and the Horten brothers in Germany, where Hugo Junkers had in 1910 patented a wing-only glider concept. Junkers started work in 1919 on his "Giant" JG1 design, intended to seat passengers within thick wings, but in 1921 the Allied Aeronautical Commission of Control ordered the incomplete JG1 destroyed for exceeding post-war size limits on German aeroplanes. Junkers conceived futuristic flying wings for up to 1,000 passengers; the nearest this came to realisation was in the 1931 Junkers G-38 34-seater Grossflugzeug airliner, which seated passengers in cabins inside the leading edge of the inboard wing panels. One G-38 entered service with Lufthansa; it was later put to military use until being destroyed in 1941. Several late-war German military designs were based on the flying wing, or modifications of it, in order to extend the range of the otherwise very short-range jet engined aircraft. Most famous of these would be the Gotha Go 229 fighter. After the war a number of experimental designs were based on the planform but the problems soon became evident. Some general interest remained until the early 1950s in order to extend the range of bombers, culminating in the Northop B-49, which did not enter production. Even the flying wing design could not make up for the fuel use, and much larger conventional aircraft like the Boeing B-52 were built instead. Interest was renewed in the 1980s as a way of designing an aircraft with the fewest possible parts to show up on radar, which eventually led to the Northop B-2 Spirit stealth bomber. In this case the aerodynamic advantages of the flying wing are not the important issues. The design still remains at its best in the slow-to-medium speed range, and there has been continual interest in using it as a tactical airlifter design. Boeing continues to work on paper projects for a Lockheed C-130 Hercules sized transport with better range and about 1/3rd more load. A number of companies, including McDonnell Douglas and de Havilland did considerable design work on flying-wing airliners, but to date none have entered production. The delta-wing is a wing planform in the form of a large triangle. Its use was pioneered by Alexander Lippisch prior to WWII in Germany, but none of his designs entered service. After the war the delta became the favoured design for high-speed use, and was used almost to exclusion of other planforms by Convair in the United States and Dassault in France. In early use delta-winged aircraft were often found with no other horizontal control surfaces, creating a tailless design, but most modern versions use a canard in front of the wing to modify the airflow over it, most notably during lower altitude flight. The primary advantage of the design is that the wing's leading edge remains behind the shock wave generated by the nose of the aircraft when flying at supersonic speeds, which was a distinct improvement on traditional wing designs. Another advantage is that as the angle of attack increases the leading edge of the wing generates a huge vortex which remains attached to the upper surface of the wing, making the delta have very high stall points. The combination of these two features is a dream come true, a normal wing built for high speed use is typically dangerous at low speeds, but in this regime the delta transitions to a mode of lift based on the vortex it generates. Lippisch studied a number of ramjet powered (sometimes coal-fueled!) delta-wing interceptor aircraft during the war, one progressing as far as a glider prototype. After the war Lippisch was taken to the US, where he ended up working at Convair. Here the other engineers became very interested in his interceptor designs, and started work on a larger version known as the F-92. This project was eventually cancelled as impractical, but a prototype flying testbed was almost complete by that point, and was later flown widely as the XF-92. The design generated intense interest around the world. Soon almost every aircraft design, notably interceptors, were designed around a delta-wing. Examples include the Convair B-58 Hustler, the Avro Arrow and the MiG-21. Deltas fell out of favour due to some undesirable characteristics, notably flow-separation at high angles of attack (swept-wings have similar problems), and high drag at low altitudes. This limited them primarily to the high-speed, high-altitude interceptor roles. A modification, the compound delta, added another much more highly swept delta wing in front of the main one, to create the vortex in a more controlled fashion and thereby reduce the low-speed drag. As the performance of jet engines grew, fighers with more traditional planforms found they could perform almost as well as the deltas, but do so while maneuvering much harder and at a wider range of altitudes. Today a remnant of the compound delta can be found on most fighter aircraft, in the form of leading edge extensions. These are effectively very small delta wings placed so they remain out of the airflow in cruising flight, but start to generate a vortex at high angles of attack. The vortex is then captured on the top of the wing to provide additional lift, thereby combining the delta's high-alpha "trick" with a conventional highly efficient wing planform.